Taking a completely new approach to fabricating cheap, disposible microfluidic devices for medical tests, solar concentrators and other short-term applications, Shrink Nanotechnologies prints them with ink-jet printers, then shrinks the templates to the micron scale. Look for low-cost assay chips using the technology invented by Shrink founder, Michelle Khine, by 2010. R.C.J. Michelle Khine, a professor at the University of California at Irvine, will be honored next month for inventing a method for fabricating microfluidic devices without a clean room. Khine will be one of 35 innovators under age 35 to be honored during the Massachusetts Institute of Technology's Emerging Technologies Conference (EmTech2@MIT, Sept. 22-24). Khine used a toy called Shrinky Dinks (K&B Innovations Inc., North Lake, Wis.) to make prototypes of a microfluidic lab-on-a-chip. Traditional microfluidic channels used for routing fluids through a battery of tests are manufactured in a clean room using semiconductor and MEMS fabrication equipment. Khine's innovation was to print microfluidic channels on Shrinky Dink plastic sheets, then shrink them in a low-temperature oven from the millimeter to the micron scale. A solar concentrator application is a film that can be installed like a window shade over the top of existing solar panels to shift UV frequencies into the infrared range, thereby enhancing solar cell efficiency. 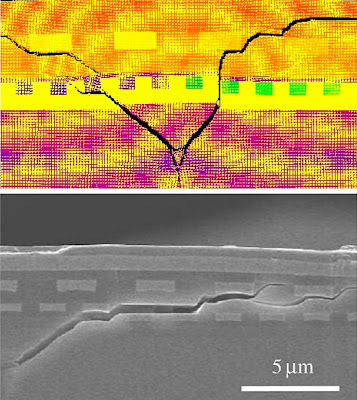 "MATERIALS: Heading off chip flaws during design"
As chips approach the atomic scale in dimensions, the possibilities increase for cracks to develop during manufacturing, or for fractures to develop during use. To the rescue is a new method called peridynamic theory which can predict faults before they happen--giving engineers the chance to fix the weaknesses before fabricating the chips (check out the figure below where a predicted crack, top, was confirmed experimentally, bottom). Look for peridynamic theory to become a integral part of the test and verification suite used by design engineers for new chips over the next five years. R.C.J. Engineers could detect design flaws resulting in cracks, fractures and interface faults before chip fabrication using a new method that harnesses an electronics failure simulation technique called peridynamic equations. Instead of the traditional differential equations and finite element methods used to model semiconductors, investigators from Semiconductor Research Corp. (SRC) and University of Arizona propose that manufacturers adopt peridynamic equations in order to spot faults involving discontinuities during the chip design stage. "CHIPS: Small engines get greener"
Until recently, small displacement gasoline engines used in everything from motorscooters to lawn mowers were exempt from the same stringent regulations that apply to modern cars. As new regulations come into effect (in the U.S. by 2015) small engine makers are scrambling to find analog chips scaled down from the multi-cylinder chips used in cars. Freescale claims to have the first of these chips for converting one- and two-cylinder gasoline engines into green machines. Look for greener motor scooters, lawn mowers and more as early as next year. R.C.J. 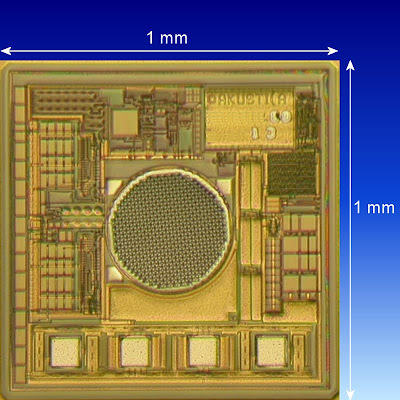 Emissions from small gasoline engines could be reduced using a new analog chip that Freescale Semiconductor just announced. 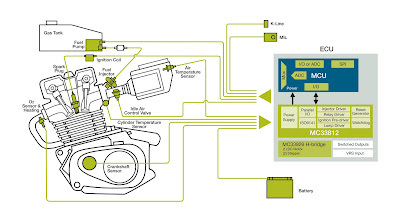 Using an engine control unit (ECU) with fuel injectors, instead of a carburator, the analog MC33812 IC is said to cut emissions on one- and two-cylinder engines used for lawn mowers and scooters. To help small engine makers meet stringent new emission regulations while also increasing fuel economy, Freescale designers created a chip to control all analog functions. The chip is said to bring small engine control on a par with car engines. The MC33812 chip allows small engine manufacturers to eliminate spark plugs, carburator and distributors for spark coils, fuel injectors and a crank-position sensor. "ROBOTICS: fish automatons to run in schools"
In nature, fish swim in schools without the assistance of wireless radio communication, and now researchers are claiming that they can mimic the algorithm they use. By programming simple autonomous robots to swim together, researchers hope to harness natures algorithms to perform functions with cheap plentiful robots rather than concentrating resources in expensive individual models. Look for schools of swimming robot, flocks of flying robots and swarms of insect robots within the next five years. R.C.J. Robotic fish could swim in schools of hundreds to perform surveys, environmental monitoring, reconnaissance and other underwater tasks, according to Massachusetts Institute of Technology researchers who recently displayed prototypes. 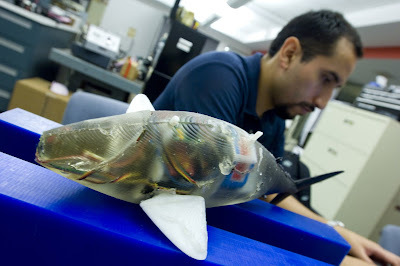 Measuring just a few inches long, the robotic fish combine flexible polymers with microprocessor controllers to swim, observe and return to report their findings. The polymer compounds used to make the fish were of variable stiffness in different sections to perform the functions of discrete components. MIT's original design back in 1994 had over 2,000 components, including six motors. Other research teams at the University of Essex have continued to design robo-fish using traditional materials, but the MIT researchers took a cue from the design of modern prosthetic limbs to make their robo-fish cheaper and more reliable by virtue of reducing the number of moving parts to just 10, including a single motor. "CHIPS: Silicon circuit board seeks to replace ASICs"
3D chip stacks of bare die promise to shorten interconnection lines, but the vertically packed chips heat each other up, making the silicon circuit board (SiCB) from siXis a viable alternative. Billed as a poor-man's ASIC, the technique packs bare die side-by-side for easier cooling, using short interconnections on the SiCB that are as fast as 3D stacking, but cheaper than even a standard ASIC. Look first for military applications moving to SiCB, then a general migration over the next few years. R.C.J. You may be able to kiss that printed-circuit board good-bye soon, instead mounting bare die on a wafer-scale silicon circuit board that essentially eliminates the power-hungry soldered interconnections between packages. Startup siXis Inc. (Research Triangle Park, N.C.) recently selected foundry SVTC Technologies (San Jose, Calif.) to fabricate its embedded silicon board computing modules. 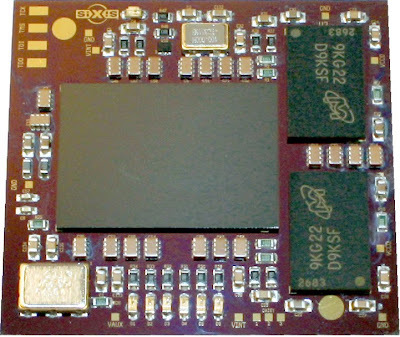 It claims the boards will bridge the gap between pc-board prototypes and ASIC-based designs. The silicon circuit board also is billed by siXis as a low-cost, low-power replacement for ASICs. The company is advising customers to program their logic into an FPGA, select memory chips and peripherals, then let siXis install bare die versions of the chips on a custom silicon board, essentially creating what it claims is a system-in-package. "MEMS: Knowles Acoustics ships billionth MEMS microphone"
Knowles Acoustics (Itasca, Ill.) has shipped its one billionth micro-electro-mechanical system (MEMS) microphone, which the company claims makes it the world's largest supplier. Sales of its surface-mount SiSonic MEMS microphone has catapulted Knowles Acoustics into the top MEMS microphone slot as well as placed it in the top five MEMS suppliers for consumer and mobile applications, according to iSuppli Corp. (El Segundo, Calif.) Knowles Acoustics, a supplier of traditional electret microphones, delivered its first MEMS microphone in 2003, two years behind the debut of the world's first MEMS microphone by Akustica Inc. (Pittsburgh). Since then Knowles Acoustics has become the world's largest supplier of MEMS microphones, passing by Akustica who claims to have delivered only five million microphones to date. Akustica was recently acquired by Robert Bosch North America. Knowles manufactures its SiSonic MEMS microphones in its own dedicated 80,000 square foot fab in Suzhou, China, where it currently makes 30 different models of MEMS microphones, which it supplies to makes of mobile phones, laptop computers, gaming systems, and Bluetooth headsets. "MEMS: Bosch acquires MEMS microphone pioneer Akustica"
With the MEMS microphone market growing quickly, and most established players like Knowles Acoustics getting the lion's share, Bosch's brand could lend a hand to Akustica who was just acquired by the German giant. Look for Akustica to capitalize on Bosch's extensive worldwide network to boost sales almost immediately. R.C.J. MEMS microphone pioneer Akustica Inc. has been acquired by Robert Bosch North America and will become part of its MEMS division, Bosch Sensortec GmbH (Reutlingen, Germany). All of Pittsburgh-based Akustica's employees will be hired by Bosch, and the new company will continue to operate as an independent, wholly-owned subsidiary at Akustica's U.S. headquarters. Financial terms of the agreement were not disclosed. The companies claim that the MEMS market will reach $2.5 billion worldwide by 2012, and that the microphone market is fastest growing segment at annual rate of greater than 30 percent, which they say is on track to ship a billion units by 2012. "MATERIALS: Active invisibility cloaks could work at many wavelengths"
Invisibility cloaks usually harness exotic metamaterials to passively route electromagnetic waves around objects, effectively masking them from view. Unfortunately, passive cloaks only work for specific wavelengths enabling snoops to just switch scanning frequencies to defeat cloaking. A new active cloak, however, could mask objects from view at any wavelength by using a countering signal exactly matched to that of the scanning probe regardless of its frequency. Look for active cloaks to begin masking military projectiles within five years. R.C.J. Active cloaking devices can use destructive interference, similar to noise-cancelling headphones, to render invisible areas up to 10 times larger than the wavelength of light being disguised. Unlike passive invisibility cloaks that use exotic metamaterials, active cloaks require as few as three antennas surrounding the cloaked area to render it invisible. Metamaterial cloaks work with free-air resonators that bend incoming waves of a single frequency around the object to be cloaked. Active cloaks, on the other hand, monitor the incoming waveforms composed of multiple frequencies, then produce a canceling signal that prevents the electromagnetic radiation from reaching the cloaked object. Outgoing radiation on the far side of the object is then reconstructed to make it appear as if the waves traveled unobstructed through the cloaked area. "MATERIALS: IBM harnesses DNA to pattern nanoscale circuits"
Deoxyribonucleic acid (DNA) has been proposed as a scaffold to self-assemble nanoscale components like carbon nanotubes into circuits too small to create with traditional lithography. 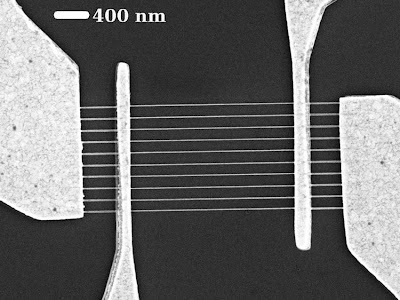 The technique holds the promise of extending chip fabrication methods beyond the end of the International Technology Roadmap for Semiconductors (ITRS). Look for DNA to become intergrated with chip fabrication equipment in about 10 years. R.C.J. IBM Corp. researchers say they have harnessed DNA to position nanoscale components like carbon nanotubes and silicon nanowires into circuits 10 times smaller than can be achieved with current lithographic techniques. 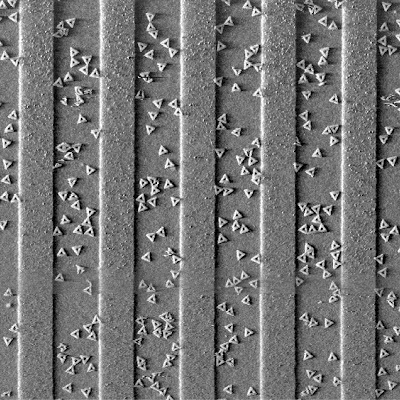 The new technique was invented at CalTech and perfected by a team of 10 IBM scientists who used e-beam lithography to create triangular-shaped patches on a substrate that match the shape and size of its DNA circuits--about 130 nanometers on an edge. The patches electrically attracted and oriented the DNA structures, each of which incorporated a pattern of hooks that could be customized to hold future nanoscale components of the circuit. "ENERGY: Nanospears promise to supercharge solar cells"
Conventional solar cells are tuned to a particular wavelength of light--usually the red end of the visible spectrum even though almost as much sunlight is present at the blue end of the spectrum too. But by combining materials that absorb both the red and blue end of the visible spectrum, the efficiency of solar cells can be greatly improved--especially on cloudy days when most of the radiation is blue. Look for supercharged solar cells within five years. By studding the top of solar cells with nanospears of zinc oxide (ZnO), the spectrum of light absorption can be expanded to enhance their efficiency, according to researchers at the Missouri University of Science and Technology (Rolla). The researchers grew zinc oxide on top of silicon solar cell, so that the nanoscale spears could absorb long UV wavelength while allowing the shorter IR wavelengths to pass onto the silicon, thus combining both UV and IR absorption. Since the hybrid material both absorbs and emits light, it may also find applications with ultraviolet lasers, wide-spectrum solid-state lighting and in new types of piezoelectric devices, according to the researchers. Previous attempts to grow zinc oxide atop silicon have achieved only limited success, according to Switzer, due to the lattice mismatch between the two materials. The problem was resolved by tilting the axis of the zinc oxide lattice so that it precisely matched that of silicon. 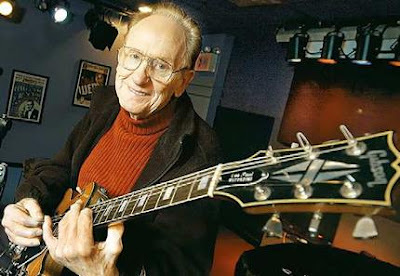 Les Paul, inventor of the solid-body electric guitar, died at 94 in White Plains N.Y. Although both Leo Fender and Adolph Rickenbacher independently invented solid-body guitars near the 1939 date that Les Paul build his first model--called "The Log"--it was his design that was immortalized when Gibson Guitar Corp. licensed his name for their first solid-body guitar in 1952. The Les Paul guitar remains the longest lived and most popular solid-body guitar model today. Les Paul also invented many commonly used recording techniques include overdubbing, tape delay, phasing effects, and multitrack recording. Les Paul was born "Lester William Polsfuss" on June 9, 1915 in Waukesha, Wis. His grade school piano teacher told his parents that he would never learn music, but by high-school he had learned the harmonica, banjo and guitar. At 10 he invented the harmonica holder with a coat hanger. As a teenager, he amplified an acoustic guitar by by wiring it into a tube radio after adding a home-made electronic transducer--today called a guitar-string pickup--he made from ham-radio parts. He recorded his songs with a homemade multitrack recorder made from a Cadillac flywheel and a belt from a dentists drill. Unfortunately, feedback plagued his amplified acoustic guitar in concert, because of the strong resonance associated with the dimensions of their hollow body, prompting him to invent a solid-body guitar which did not feedback on stage. Besides its lack of feedback, Les Paul's guitar also harnessed the vibrational sustain of a solid piece of wood to length the time that notes would sound. Acoustic guitars depended on the resonance of a hollow cavity to increase the volume of sound coming from a guitar, but at the expense of shorter sustain. Les Paul's solid-body guitar, on the other hand, sacrificed volume for longer sustain, then used an electronic pickup to compensate for the lower volume by amplifying the sound. Today electric guitarists continue to use electric models that are based on these principles established by Les Paul and Gibson over 50 years ago. The Les Paul "Standard" model has remained unchanged by modern innovations from 1958 until today. The Les Paul is used by many guitarists to this day, including icons like Jimmy Page of Led Zeppelin and Slash of Gun's N' Roses. Gibson has introduced many different alternative models of the Les Paul guitar over the years, including the Les Paul Robot Guitar that debuted in 2007. The Les Paul robot guitars include all the modern gadgets that could be strapped onto the original design, including motorized self-tuning, digital signal processing and acoustic modeling that enables the guitar to mimic the sound of other popular models from Fender, Rickenbacher and others. "MATERIALS: Ferroelectric DRAM smaller, faster than flash"
Ferroelectric memories are already available from Ramtron and Texas Instruments, but their densities are much less than flash, relegating their use to niche applications where their higher speed and longer life make up for their lack in capacity. Flash memories are higher density, but slow to read/write, which is why for over a decade, materials researchers have sought a ferroelectric material that could work in flash. Now Yale researchers say we should give up the quest for ferroelectric flash, and instead adapt ferroelectrics to DRAM, which could propel FeDRAM past flash. Researchers at Yale University and the Semiconductor Research Corp. (SRC) claim that ferroelectrics are more appropriate for replacing DRAM than flash. Current DRAM technology has to be refreshed every few milliseconds; ferroelectric materials could last minutes without freshing. Yale and SRC researchers recently demonstrated an experimental ferroelectric transistor for FeDRAMs that retained information 1,000 times longer than DRAMs, consumed 20 times less power and can, they claim, be scaled to even the most advanced nodes on the International Technology Roadmap for Semiconductors. 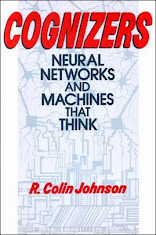 Neural networks are circuits that simulate the functions of neurons and their interconnecting synapses in the human brain. Hewlett Packard has announced its memristor component that can perform the function of a synapse, but IBM has its own ideas about how to harness nanotechnology to achieve the goal. Look for artificial brains to start appearing within 10 years. R.C.J. All the rage a decade ago, neural networks are making a comeback at the Defense Advanced Research Projects Agency (Darpa). Last year, the agency resurrected efforts to create brain-like electronic circuitry to automatically learn the relevant features and associations needed to recognize objects. Last week, IBM Corp. received a $16.1 million contract from Darpa for a program called SyNAPSE (Systems of Neuromorphic Adaptive Plastic Scalable Electronics). Current systems for pattern recognition of enemy tanks, for example, depend on hand-crafted algorithms, but SyNAPSE aims to automate pattern recognition by mimicking the human brain. 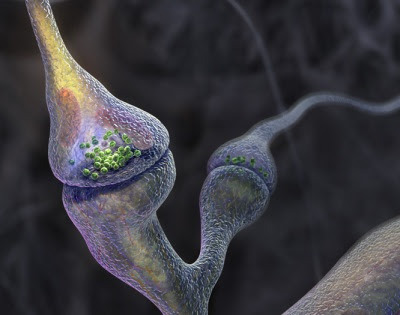 To achieve ithis goal, researchers need a synapse--the adaptive connection between neurons in the brain that changes values in response to perceived patterns. Synapses change the connection strength between neurons to learn new patterns without traditional programming. IBM's charter is to develop materials that facilitates the changes that adapt to new patterns, categorize the features that will enable recognition and can interface with conventional computers to provide them with learning capabilities. Besides developing a working synapse, the project will also simulate synaptic components in special-purpose cores that support the adptaive learning architecture needed for automatic pattern recognition systems. 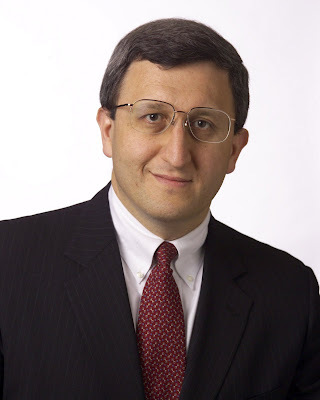 "MEMS: pioneer/guru heads to Darpa"
MEMS pioneer Kaigham ("Ken") Gabriel has been appointed deputy director of the Defense Advanced Research Projects Agency (Darpa). Gabriel was founder and previously served as chairman and chief technology officer of MEMS microphone pioneer Akustica Inc. (Pittsburgh), Gabriel's duties at Darpa will include overseeing research, development and demonstration of concepts, devices, and systems for the military. Gabriel will serve under new Darpa Director Regina Dugan, who was appointed in July. Gabriel earned his Ph.D. in Electrical Engineering and Computer Science from the Massachusetts Institute of Technology (MIT) in 1983, after which he joined AT&T's legendary Bell Labs where he pioneered micro-electro-mechanical systems before they had acquired the MEMS moniker. At Bell Labs he developed the concept of using semiconductor fabrication equipment to craft tiny mechanical devices for photonic and networking applications. While on sabbatical, he became a visiting professor at the University of Tokyo, where he led a joint MEMS project at IBM Japan Research, Toyota Central Research Laboratories and Ricoh Research Park. 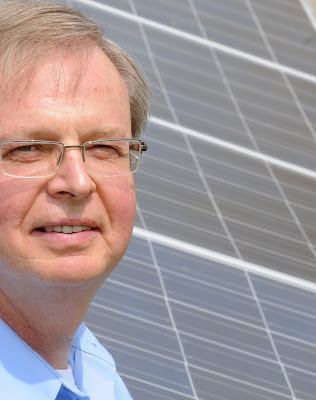 Before leaving Bell Labs in 1991, he spent a year as a visiting scientist at the Naval Research Laboratory, transferring MEMS to its Nanoelectronics Processing Facility, after which he joined DARPA to start the agency’s MEMS Program. There he managed over 70 projects in the $80 million a year program and eventually became DARPA's Director of the Electronics Technology Office in 1996 where managed its $450 million budget for advanced lithography, electronics packaging, optoelectronics, millimeter and microwave integrated circuits, and high-definition displays. Gabriel left DARPA to joint the faculty of Carnegie Mellon University in 1998, where he developed the concept of making CMOS microphones using MEMS technologies, which was eventually spun off from CMU in 2001 into the commercial venture, Akustica Inc. (Pittsburgh). In 2003, Gabriel was awarded the Technology Pioneer title at the World Economic Forum, and in 2005 he co-founded the MEMS Industry Group (MIG, Pittsburgh). He is widely regarded at one of the father of the MEMS industry worldwide. "QUANTUM: NIST scales up quantum computing"
The National Institute of Standards and Technology (NIST) is perhaps the world's most ardent supporter of trapped-ion quantum computers which store qubits on electrically charged atoms. By isolating them inside a quantum well, NIST can now move them among six zones where quantum computing operations are performed. Look for full-fledged quantum computers within the next five years. R.C.J. Researchers at the National Institute of Standards and Technology (NIST, Boulder Colo.) said they demonstrated continuous quantum operations using a trapped-ion processor. The quantum computer maintained a 94 percent accuracy rate in multistep operations for quantum bits. These qubits passed intermediate results to the next processing stage for up to 15 seconds. NIST's quantum artithmetic-logic unit demonstrated sustained operations that proved the feasibility of large-scale quantum computers. The sequence of quantum operations used five arithmetic-logic operations--four single-qubit operations and a two-qubit operation--involving 10 transport operations. The sequence of operations took about 20 milliseconds and was repeated 3,150 times for each of 16 different starting states. The sustained operations could be performed for as long as 15 seconds before errors occurred. The current prototype used no error-correction procedures, but was constructed to test the limits of trapped-ion quantum computers. "OPTICS: Illinois Tool Works aims to become photonics powerhouse"
As optical technologies diversify into sensors, actuators, displays and processing, what used to be niche components have entered the mainstream, attracting manufacturing giants like Illinois Tool Works. Look for ITW to become a major supplier of integrated optical subsystems for automotive, industrial, medical and consumer applications. R.C.J. "MEMS: Lab-on-a-chip performs 1,024 simultaneous tests"
Dr. McCoy--nicknamed "Bones" in Star Trek--used a handheld scanner to diagnose patient's instantly. 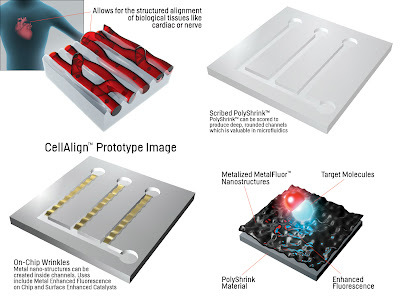 We are not quite there yet, but one step along that path was made recently by researchers who performed over 1000 medical tests simultaneously using a microfluidic lab-on-a-chip. 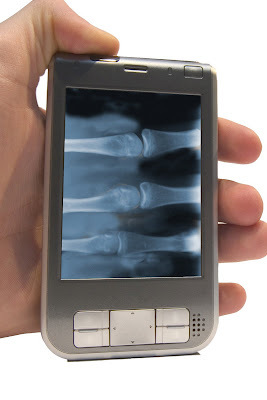 Look for handheld medical diagnostic devices using labs-on-a-chip within the decade. R.C.J. 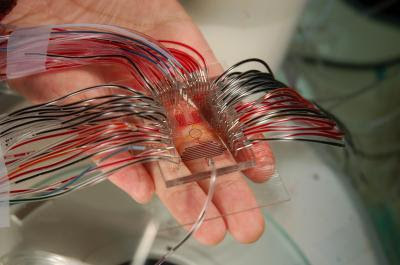 Microfluidic lab-on-a-chip technology has enabled researchers to conduct over 1,000 tests simultaneously. Researchers at the University of California at Los Angeles claim their lab-on-a-chip is the first to perform 1,024 parallel operations, thereby completing tests in hours rather than days or weeks. 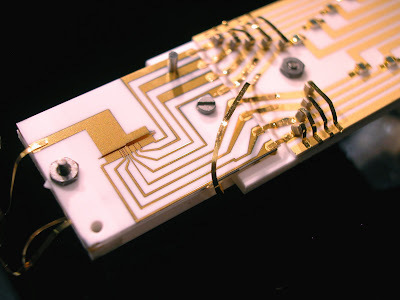 A microfluidic lab-on-a-chip etches tiny channels (for storing, mixing and testing chemical compounds) on a chip. The technology uses equipment originally designed for semiconductor fabrication, but has been repurposed for microelectromechanical systems (MEMS). Other efforts are underway to commercialize microfluidic MEMS chips, but UCLA claims to be the first to demonstrate more than 1,000 chemical reactions at once on a stamp-sized, computer-controlled microchip. "MATERIALS: Graphene nanoribbons cut power use, cooler than copper"
Future chips will be pure carbon, since carbon monolayers fabricated into graphene nanoribbons outperform both the silicon from which devices are made, as well as the copper used today for interconnecting them. Look for graphene to replace both silicon and copper over the next decade. R.C.J. Graphene carries nearly 1,000-times more current and runs over 10-times cooler than conventional copper interconnects below 22-nanometer line widths, according to researchers at the Georgia Institute of Technology (Georgia Tech). The graphene nanoribbons tested at Georgia Tech could carry as much as 10 billion amps per square centimeter. The superior current carrying capability of carbon formed into graphene nanoribbons is also combined with less heat build-up, offering a thermal conductivity of 1,000-to-5000 watts per meter Kelvi. The Georgia Tech researchers also claim that graphene nanoribbons will mitigate electro-migration which is an increasing problem for copper as line widths descend to the nanoscale. There are three hurdles remaining to commercialization of carbon interrconnects, according to the researchers at Georgia Tech: perfecting methods of growing monolayers of graphene over entire wafers (since today only small centimeter-sized areas can be easiliy grown in monolayers), fabricating vias to interrconnect graphene nanowires, and integration of carbon into the back-end of process on a CMOS line.